As one of London’s hidden cultural hubs, Canary wharf is most known for it’s financial bustle and connection to the world of business. Canary Wharf however, is also home to prominent public art. Below is a Top Guide to Canary Wharf’s art scene, perfect for a casual visitor or resident! Cabot Square, which is dominated by an impressive central fountain and is surrounded by pop-up cafes and restaurants in summer. This is a great family space. Henry Moore’s ‘Draped Seated Woman’ – affectionately nicknamed ‘Old Flo’, is situated on Cabot Square. This cast was originally acquired by London County Council as part of the LCC’s Patronage of the Arts Scheme to site works of art in housing estates and other public spaces, for the enjoyment of the local population. The sculpture was located on the LCC’s newly built Stifford Estate in 1962, remaining there until 1997, soon after which the estate was demolished. Since then the sculpture stayed in Yorkshire, overlooking the landscape and enjoyed by the Sculpture Park’s many visitors. Next up is Westferry Circus. Westferry Circus, to the far west of Canary Wharf, is a beautifully planted walled garden in the centre of the eponymous roundabout. You can hardly hear the traffic, and will be wowed by the perfectly cropped grass in the middle of the area. It is a stone’s throw from the Riverside Plaza Hotel, the Thames, and a number of great waterside restaurants. Finally, Jubilee Park is found to the south of One Canada Square (between the two main entrances to Canary Wharf tube station). 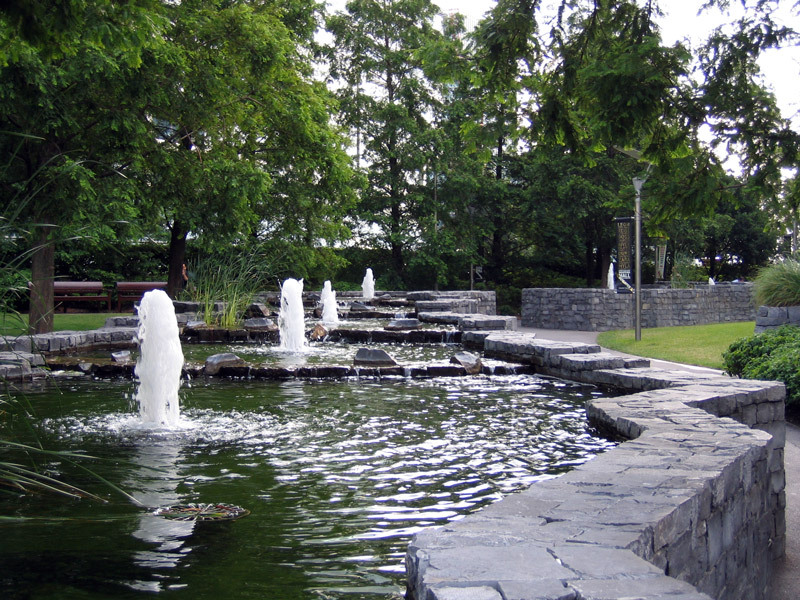 Filled with trees, grassy areas and water-features, this is a great place to explore. You might even forget where you are, until you look up. Located here is Emma Biggs’ ’ Wharf Walk taking us through the Jubilee Place shopping mall, following a trail of floor mosaics depicting some of the trades that passed through the original dockyards that flourished here in earlier times. Each image is framed by a piece of evocative text, derived from Biggs’ careful research for the commission in 2003. In 2013, when the mall was extended to a lower floor, Biggs was invited to create four new mosaics on the same theme. Wharf Walk now comprises 17 floor mosaics in all and is easily accessible any day of the week! Giles Penny’s Man With Open Arms, found amongst the topiary on West India Avenue, a bronze of a man leaning back with open arms. Robert Worley’s Avatar, located in Westferry Circus, a large golden sculpture resembling a cross between a hawk and a dalek. Jon Buck’s Returning to Embrace, on the 10 Cabot Square forecourt, a bronze showing an embracing couple staring into each other’s eyes. Sophie Smallbone’s Colour East, on the concourse of Canary Wharf’s tube station, pictured.